Norman 4200 Series Inline Filters provide a compact lightweight In-Line filter for reliable economic protection of critical components. Protection – Wire mesh, porous sintered media or random metal fiber options are available in sizes ranging from 0.5 to 200 microns giving you a wide variety of options to suit your needs. Service Life - All wire mesh and RMF options are pleated creating larger surface area and dirt holding capacity vs simple flat discs. 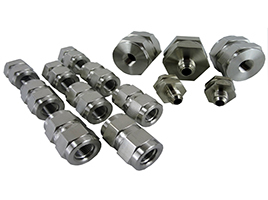 Connections – “Mix-and-Match” male and female connections – pipe thread, flared tube, compression fitting and SAE O-Ring – to adapt to your installation. Construction - All welded construction offers outstanding working temperatures (-320˚ F to + 800˚), and no leakage. ASME Section 8/B31.3 compliant design with full penetration weld. Excellent performance in high temperature applications do to all welded design (no elastomer seals). Click on size to view data sheet.